Caitlyn Hasek has been passionate for the art of dance since the age of 3. While training with Broadway dance professional, Jan Plesniak at Lakeshore Gymnastics and Dance, she also performed in several ballet productions at the Star Plaza Theatre including Cinderella, Firebird, Sleeping Beauty, Peter Pan, and The Nutcracker with the Indiana Ballet Theatre NW. Caitlyn is also passionate for tap, jazz and lyrical and continues her training with Hubbard Street Dance Chicago. In addition to her love for dance, Caitlyn is also dedicated to teaching. She began teaching dance and gymnastics classes in 2002 at the age of 16 at Lakeshore Gymnastics and Dance and has recently joined the UDA staff in 2011. She was also a member of the Chesterton High school state championship gymnastics team. Caitlyn is a graduate from Purdue University North Central with a Bachelors degree in Elementary Education with an Early Childhood addition. During her student teaching experience, Caitlyn was nominated for “Outstanding Future Educator of the Year” while teaching Kindergarten at Indian Trail Elementary school in LaPorte, IN. For the upcoming 2012-2013 school year, Caitlyn will be director of the new UDA Dance Academy Preschool and will be teaching preschool for children between the ages of three to five at the new location. Dance and dance education is a lifework of Melina Yallourakis. She began dancing at Judi Conti’s Dance Studios in Youngstown, Ohio at seven years of age. 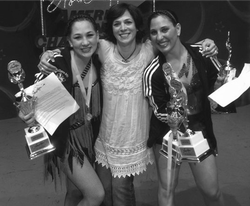 Melina studied under Judy through grade school eventually teaching at the studio before moving on to college. Using her dance skills, Melina also led her cheerleading squad at Campbell Memorial High School. Melina majored in physical education at The Ohio State University where she continued to study dance and sports physiology. She has performed in the musical 42nd Street and Anything Goes. While living in California, she managed a dance studio where she continued her dance education., After getting married and living in California for five years, she returned to the mid-west to raise her family. Soon it was time for her two daughters to start dancing and after some experience with local studios, the vision of creating a studio in Northwest Indiana based on strong fundamental training and a family atmosphere took hold. She has built the premier dance education facility in the area and has grown each year as the word has spread. Melina will continue her work to represent dancers at the studio who want to dance or model professionally. Melina would like to stress that, equally important to your child's development, is the atmosphere of sportsmanship, positive attitude and a general feeling of enjoying your classes and your classmates. Any one interested? Contact Melina.